Hall, K.A. and Hooper, J.N.A. (2018) SpongeMaps - an online community for sponge taxonomy. Hall, Kathryn A. and Hooper, John N.A. (2017). Beyond the sponge barcode: testing the taxonomic utility of microbial diversity analysis using 16S rRNA gene sequences among tetillid sponges. In: 10th World Sponge Conference, Galway, Ireland, (). June 2017. Hall, Kathryn A., Sutcliffe, Patricia R., Hooper, John N. A., Alencar, Aline, Vacelet, Jean, Pisera, Andrzej, Folcher, Eric, Bourgeois, Bertrand, Butscher, John, Renaud, Armelle, Lerouvreur, Franck, Fleurisson, Dominique, Orempuller, Joel, Maihota, Nicolas, Levy, Peva, Hertrich, Lionel, Petek, Sylvain and Debitus, Cecile Sponges of Polynesia. Edited by Sylvain Petek and Cecile Debitus Papeete, French Polynesia: IRD, 2017. Hall, K. A. and Cribb, T. H. (2005). Family Gyliauchenidae Fukui, 1929. In A. Jones, R. A. Bray and D. I. Gibson (Ed. ), Keys to the Trematoda: Volume 2 1st ed. (pp. 665-678) London: CAB International. Hall, Kathryn A. and Adlard, Robert D. (2012) Designation of a lectotype for Pseudoceros kylie Newman & Cannon, 1998 (Platyhelminthes, Polycladida, Pseudocerotidae). Zootaxa, 3280: 67-67. Hall, Kathryn A. and Cribb, Thomas H. (2008) Revision of Flagellotrema Ozaki, 1936 (Digenea, Gyliauchenidae Fukui, 1929), including the description of two species from acanthuroid fishes from the Great Barrier Reef, Queensland, Australia. Zootaxa, 2008 1718: 1-35. Hall, Kathryn A. and Cribb, Thomas H. (2007) Rediagnosis of Ichthyotrema Caballero & Bravo-Hollis, 1952 (Digenea: Gyliauchenidae Fukui, 1929), including the redescription of I. vogelsangi Caballero & Bravo-Hollis, 1952. Zootaxa, 2007 1549: 63-68. Hall, K. and Cribb, T. H. (2004) Revision of Affecauda Hall & Chambers, 1999 (Digenea: Gyliauchenidae Fukui, 1929), including the description of two new species from fishes of the Indo-West Pacific. Zootaxa, 778 778: 1-12. Hall, K. A. and Chambers, C. (1999) A new genus of the Gyliauchenidae Goto et Matsudaira, 1918 (Digenea) from Naso tuberosus (Percomorpha, Acanthuridae) on the Great Barrier Reef, Queensland, Australia. Acta Parasitologica, 44 4: 229-232. Hall, Kathryn A., Vidgen, Miranda E. and Hooper, John N. A. (2017). Cinachyrella australiensis (Carter, 1886) in the Indo-west Pacific: an integrative approach to understanding a complex species complex. In: 10th World Sponge Conference, Galway, Ireland, (54-55). 25 - 30 June 2017. Hall, Kathryn A., Vidgen, Miranda E. and Hooper, John N.A. (2017). Cinachyrella: integrated approaches to taxonomy. In: 10th World Sponge Conference, Galway, Ireland, (). June 2017. Habener, Leesa, Carroll, Anthony, Hooper, John, Hall, Kathryn, Wilson, Jenny, Worthington Wilmer, Jessica and Ekins, Merrick (2013). Integrative approach to the taxonomy of the Family Mycalidae Lundbeck, 1905, using morphological, chemical and molecular datasets. In: 9th World Sponge Conference, “New Frontiers of Sponge Science”, Fremantle, WA, Australia, (). November 2013. Ekins, Merrick , Erpenbeck, Dirk , Hall, Kathryn , Bryce, Monika and Hooper, John (2013). Low Genetic Structure of lithistid sponge species between deep sea mounts off New Caledonia. In: 9th World Sponge Conference, “New Frontiers of Sponge Science”, Fremantle, WA, Australia, (). November 2013. Hooper, J.N.A., Hall, K.A., Ekins, M., Vargas, S., Erpenbeck, D., Wörheide, G. and Jolley-Rogers, G. (2013). Pumping Indo-west Pacific sponges through the taxonomic pipeline: The Sponge Barcoding and SpongeMaps Projects. In: 12th Pacific Science Inter-Congress, Suva, Fiji, (). July 2013. Erpenbeck, Dirk, Hall, Kathryn, Ekins, Merrick, Varghese, Temi, Hooper, John and Wörheide, Gert (2013). Sponge Barcoding v.2 – much more than just barcodes. In: 9th World Sponge Conference, “New Frontiers of Sponge Science”, Fremantle, WA, Australia, (). November 2013. Hall, Kathryn, Ekins, Merrick, Vidgen, Miranda, Harper, Mary Kay, Ireland, Chris, Carroll, Anthony, Habener, Leesa, Erpenbeck, Dirk, Wörheide, Gert and Hooper, John (2013). SpongeMaps: an online collaborative tool for taxonomy. In: 9th World Sponge Conference, “New Frontiers of Sponge Science”, Fremantle, WA, Australia, (). November 2013. Hall, Kathryn, Ekins, Merrick, Vidgen, Miranda, Harper, Mary Kay, Ireland, Chris, Carroll, Anthony, Habener, Leesa, Erpenbeck, Dirk, Woerheide, Gert and Hooper, John (2013). SpongeMaps: in-cloud taxonomic collaborations on Indo-West Pacific species of Theonella Gray, 1868. In: 9th World Sponge Conference, “New Frontiers of Sponge Science”, Fremantle, WA, Australia, (). November 2013. Hall, Kathryn, Ekins, Merrick, Sutcliffe, Patricia, Hooper, John, de Voogd, Nicole, Petek, Sylvain, Folcher, Eric and Debitus, Cecile (2013). The diversity of sponges from French Polynesia. In: 9th World Sponge Conference, “New Frontiers of Sponge Science”, Fremantle, WA, Australia, (). November 2013. Mitchell, K.D. , Hall, K.A. , Erpenbeck, D. , Carroll, A.R. and Hooper, J.N.A. (2011). Barcoding approaches to the taxonomy of Australasian toxic sponges. In: Fourth International Barcode of Life Conference, Adelaide, SA, Australia, (). November 2011. Worthington Wilmer, J., Adlard, R., Arango, C., Couper, P., Davie, P., Hall, K., Johnson, J., Raven, R. and Hooper, J. (2011). 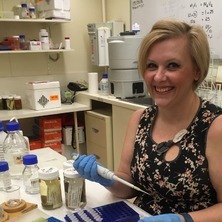 Molecular Identities Laboratory, Queensland Museum, and its role in DNA barcoding. In: Fourth International Barcode of Life Conference, Adelaide, SA, Australia, (). November 2011. Hall, Kathryn, Sri Adibhatla, Pavani, Ekins, Merrick, Nelson, Leanne, Jolley-Rogers, Garry, Erpenbeck, Dirk, Wörheide, Gert and Hooper, John (2011). SpongeMaps: integrating morphological data with DNA barcodes through a bespoke online portal. In: Fourth International Barcode of Life Conference, University of Adelaide, Adelaide, South Australia, (). November 2011. Erpenbeck, Dirk , Hall, Kathryn , Büttner, Gabriele , Schätzle, Simone , Vargas, Sergio , Voigt, Oliver , Sacher, Katharina , Schuster, Astrid , Läuchli, Benjamin , Lauthenschlager, Stephan , Beierl, Sabine , Haszprunar, Gerhard , Hooper, John N.A. and Wörheide, Gert (2010). 1.000 Sequences and counting... Progress and workflow of the Sponge Barcoding Project. In: VIII World Sponge Conference, Girona, Spain, (). 20–24 September 2010. Sparkling Aurantoside: the mystery of some sciophilous sponges in the Indo-West Pacific. Kathryn A. Hall, Mary Kay Harper, Patricia R. Sutcliffe, Chris M. Ireland and John N.A. Hooper (2010). Sparkling Aurantoside: the mystery of some sciophilous sponges in the Indo-West Pacific.. In: Manuel Maldonado, Xavier Turon, Mikel A. Becerro and Marıa J. Uriz, VIII World Sponge Conference: Ancient Animals, New Challenges: Developments in Sponge Research, Girona, Spain, (). 20-24 September 2010. Hall, Kathryn A., Cribb, Thomas H., Yoshinaga, T. and Ogawa, K. (2005). How many bases is that? ITS2 rDNA and ND1 mtDNA sequence diversity of gyliauchenid trematodes across the Indo-West Pacific. In: Australian Society for Parasitology (in association with the WAAVP) Conference, Christchurch, New Zealand, (). October 2005. Phylogeny of the Polychaeta: what can 18S data resolve? Hall, Kathryn A., Hutching, Pat A. and Colgan, Don J. (2003). Phylogeny of the Polychaeta: what can 18S data resolve?. In: XIX International Congress of Genetics, Melbourne, Australia, (). July 2003. Hall, K.A., Hutching, P.A. and Colgan, D.J. (2002). Advances in polychaete phylogeny. In: The Genetics Society of Australia Conference, Sydney, Australia, (). July 2002. Gyliauchenid Trematodes and Morphometrics: Is size phylogenetically informative? Hall, K., Cribb, T. H. and Bray, R. A. (2000). Gyliauchenid Trematodes and Morphometrics: Is size phylogenetically informative?. In: Joint Meeting of the New Zealand Society for Parasitology and Australian Society for Parasitology. Joint Meeting of the New Zealand Society for Parasitology and Australian Society for Parasitology, Wellington, New Zealand, (C61). 24-28 September 2000. Cribb, T. H., Bray, R. A., Chambers, C., Dove, A. D., Hall, K., Pichelin, S. P. and Wright, T. (2000). The futility of life-cycle studies in the face of megadiversity: Trematodes, fishes and molluscs on the Great Barrier Reef. In: Joint Meeting of the New Zealand Society for Parasitology and Australian Society for Parasitology. Joint Meeting of the New Zealand Society for Parasitology and Australian Society for Parasitology, Te Papa, Wellington, (C62). 24-28 September, 2000. Hall, K. A., Cribb, T. H., Bray, R. A. and Littlewood, D. T. (1999). An evolutionary hypothesis for the radiation of the Gyliauchenidae Goto & Matsudaira, 1918 (Platyhelminthes: Digenea). In: Australian Society of Parasitology Capricorn 1999 Conference Handbook. The Australian Society for Parasitology Annual Scientific Meeting, Yepoon, Queensland, (40). 26-30 September1999. Hall, K. A., Cribb, T. H. and Bray, R. A. (1999). Gene-tree gives insight into evolution of unusual group. In: Interrelationships ofthe Platyhelminthes Programme & Abstracts. Interrelationships of the Platyhelminthes, Burlington House, Piccadilly, London, (16). 14-16 July 1999. Hall, Kathryn A., Cribb, Thomas H. and Bray, Rodney A. (1999). Gyliauchenidae Goto & Matsudaira, 1918 (Platyhelminthes: Digenea): co-evolution, parallelisms and diverging paths. In: The Systematics Association Biennial Conference, Glasgow, United Kingdom, (). August 1999. Hall, K. A., Cribb, T. H. and Bray, R. A. (1999). Gyliauchenidae Ozaki, 1933 (Platyhelminthes: Digenea): Coevolution, parallelisms and diverging paths. In: The Systematics Association Abstracts for Talks. Systematics Association Second Biennial Conference, Univ. of Glasgow, (19). 23-27 August 1999. Hall, Kathryn A. and Cribb, Thomas H. (1998). Primitive Petalocotyle (Digenea: Gyliauchenidae) in primitive Prionurus (Acanthuridae). In: The Australian Society for Parasitology Conference, Melbourne, Australia, (). September 1998. Hall, Kathryn A., Cribb, Thomas H. and Bray, Rodney A. (1998). Trematodes in tangs: species identification and cluster observations. In: The American Society of Parasitology Conference, Keauhou Bay, Kona, Hawaii, United States, (). August 1998. Hall, Kathryn A., Cribb, Thomas H. and Barker, Stephen C. (1997). Polyphyly of the Fellodistomidae (Platyhelminthes: Digenea): molecular phylogenies from the V4 region of small subunit of rDNA indicate three distinct lineages of fellodistomids. In: The Australian Society for Parasitology Conference, Canberra, Australia, (). July 1997. Hall, Kathryn Ann (2004). The taxonomy, systematics and evolutionary biology of the Gyliauchenidae Fukui, 1929 (1918) (Platyhelminthes: Digenea) PhD Thesis, School of Molecular and Microbial Sciences, The University of Queensland. Hall, Kathryn (1996). Molecular systematics of the Fellodistomidae (Platyhelminthes: Digenea) Nicoll, 1909, with notes on morphology and life-cycles Honours Thesis, Department of Parasitology, The University of Queensland. Hall, Kathryn (1996). Molecular systematics of the Fellodistomidae (Platyhelminthes: Digenea) Nicoll, 1909, with notes on morphology and life-cycles Honours Thesis, Department of Microbiology and Parasitology, The University of Queensland.